Posted February 9, 2016 under Ask Us. In order to understand how to prevent hair loss in the future, it’s important to know what causes hair loss. Hair loss can be caused by different factors however if a person notices that their hair is falling out gradually, over time, it is probably due to “hereditary hair loss” which is the most common cause of baldness. Hereditary hair loss is passed down from genes from both your mother and father. Other causes of hair loss can include certain medicines, an illness, poor diet, certain hair products or hairstyles, and stress. These factors usually cause sudden hair loss though. The American Academy of Dermatologists (AAD) suggests that you see a dermatologist (skin, hair and nail specialist) at the first sign of hair thinning so that the doctor can figure out what the cause might be. Treatment will depend on the cause but may simply include making improvements to your diet. 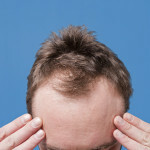 Sometimes hair loss needs no treatment as hair can sometimes grow back by itself. Tell your health care provider what medicines and supplements (if applicable) you take and how much/frequently you take them. There is no magic bullet or treatment to stop hereditary hair loss despite the ads that you may see on TV or online. These products are usually expensive and not effective.